While the 8th graders are away (on world language trips to Quebec and Costa Rica), the 6th and 7th graders play! PoP Week is a favorite tradition that allows our youngest students to delve deeply into a topic, develop new skills, and have a blast with experiential, hands-on learning opportunities. 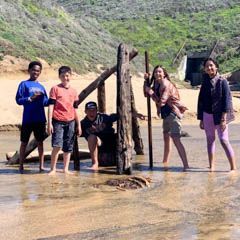 During PoP Week 2019, students created civilizations for an archaeological dig, built aquaponic farms, became stop animation filmmakers, sewed quilts, explored the California coast, were immersed Chinese culture and much more. Each group enjoyed a mix of on-campus project work and off-campus excursions ranging from trips to the Walt Disney Museum to hikes along Water Dog Lake in our backyard. Photos here, and more in Vidigami.